This section will give you an idea on what you can expect on the benchmarks to compare to your own system to see how it fares. The score we normally would look at is the standard score of 19,021 which is actually pretty impressive scoring 93% better than all other results. There we can see that the system consumed a max of 306 Watts and on average consumed 236Watts. The system pumped out a max temperature of 62°C on the CPU and a 65°C on the video card, decent temperatures, though liquid cooling unit seemed a little under powered. 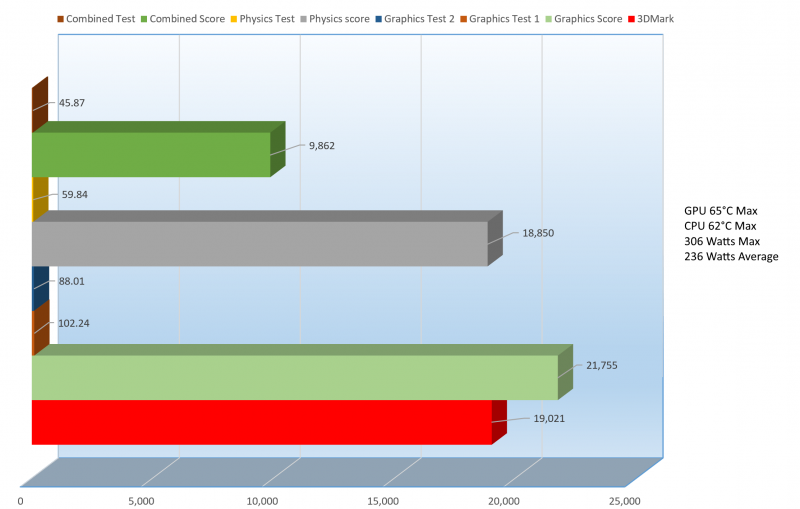 The RTX 2070 is fairing very well paired with the Core i7 9700K, but let’s check out the rest of the scores. Off of the same utility, let’s check to see what TimeSpy offered. The score here is 8,190, scoring better than 79% of all other results. While the 2070 is a great card, it might start to struggle a little at 4K, which is what TimeSpy runs at, though still not bad. On this test, we can see that the system consumed a max of 223 Watts and on average consumed 207Watts. The CPU heated up to a max temperature of 61°C and the GPU 63°C. These are decent temps, not amazing though. This focus mainly on the video card, and a little on the CPU, let’s get an overall feel of the system though and for that we will use PCMark 10. 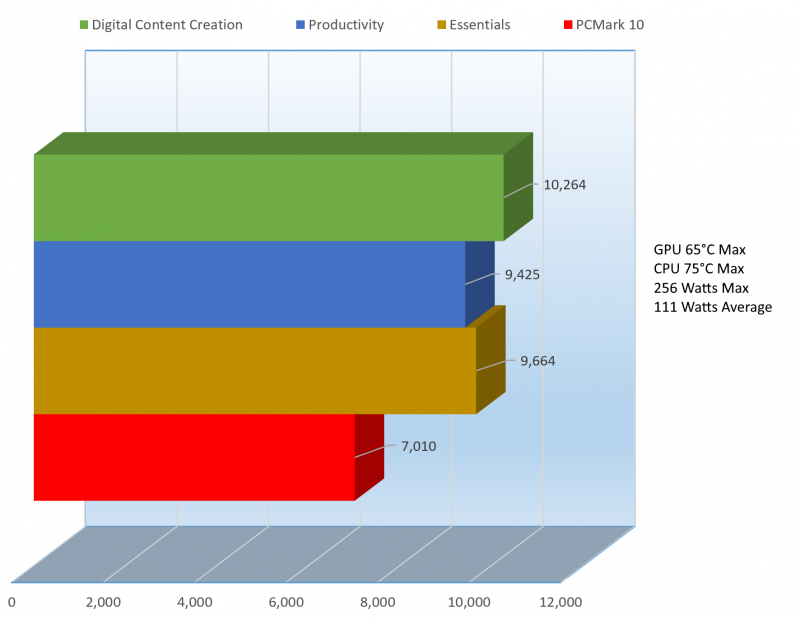 PCMark 10 benchmarks the entire system to see how well it will work in an office environment for productivity, digital content creation, web browsing and also some gaming as well. While a synthetic benchmark, it can better help you gauge overall system performance. 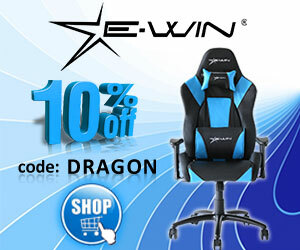 The score here is 7,010, performing better than 98% of all other results, this includes prebuilt and custom-built PC’s here, there is no bias. Coming close to the top, we can see that the system consumed only a max of 256 Watts and on average 111 Watts. The CPU heated up a bit more at 75°C and the GPU 65°C. 75°C is nothing to be alarmed about, since the point of danger where the CPU starts to throttle is 100°C. This does however show that this may not be the best liquid cooling solution, but let’s not get ahead of ourselves on this, there’s a little more to this that I will go on to a bit later in the review. So this configuration on 3 tests scored over 90% better than all other systems tested, that’s nothing to overlook, we have some serious performance here. 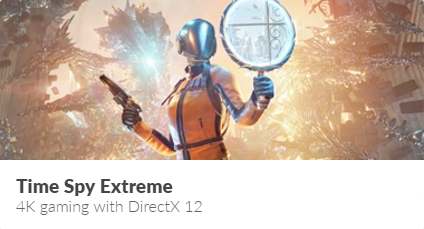 While 3DMark and PCMark are nice, you can’t play them and they only give you an idea of what you can expect, let’s check out some actual game performance. Here are my presets, I ran all tests at these settings changing only the resolutions. I tested at 1080P, 1440P and 4K UHD (3840 x 2160). Starting off at 4K, the game was playable though potentially running into some hiccups as it hit an average frame rate of 57.07 and consumed an average of 276Watts. The video card hit a max temperature of 67°C and the CPU kept its cool at 54°C which is not bad for a game. At 1440P, we hit a much better gaming experience at 105.51, a 45.91% improvement, consuming on average 267 Watts, 4.30% lower than in 4K. The CPU heated up a little more, but still manageable at a 27.8% increase at 69°C and the GPU 66°C, 1°C lower than in 4K. Finally, at a very common 1080P, the game performed 41.42% better than at 1440P, coming in at 149.21 frames per second eat up an average of 276 Watts. Since the resolution was lower, having more CPU dependency, the CPU did get 5.80% hotter at 72°C. The GPU kept it’s cool on par with its 1440P counterpart at 66°C. 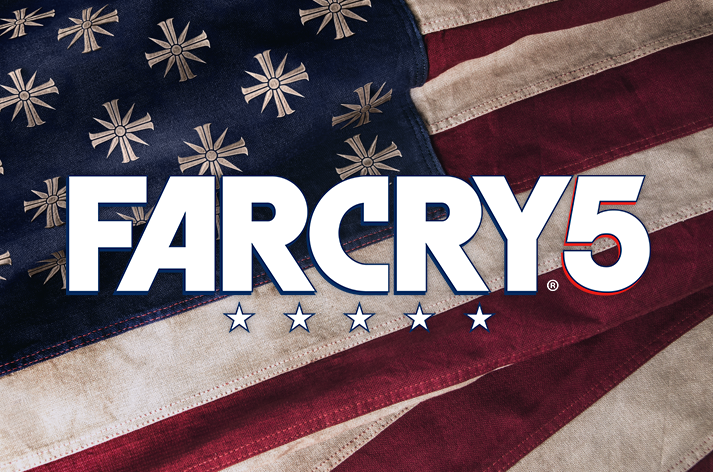 We can see the makings of a good system so far, game wise, so let’s jump into Far Cry 5. 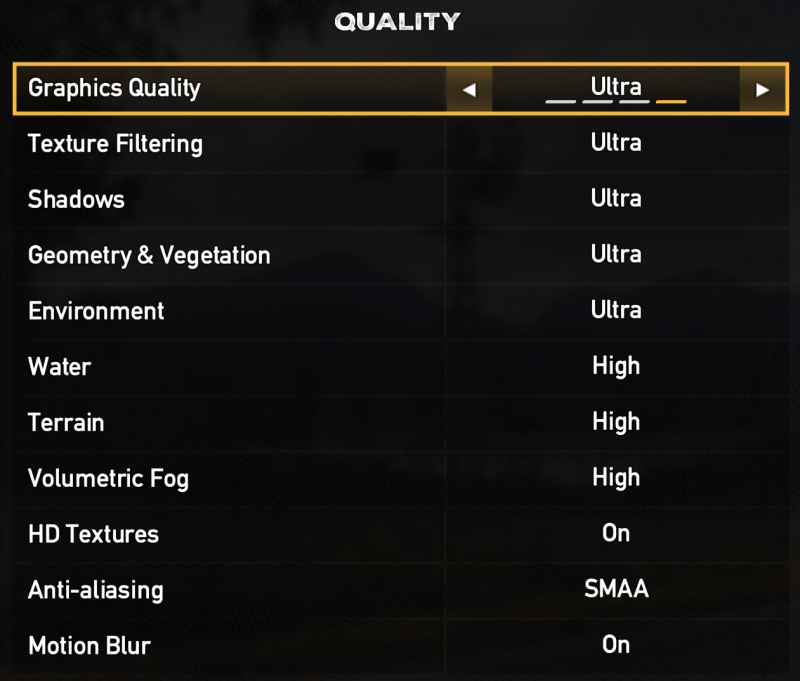 Here are the presets for Far Cry 5, I ran all tests at the Ultra Quality settings changing only the resolutions. 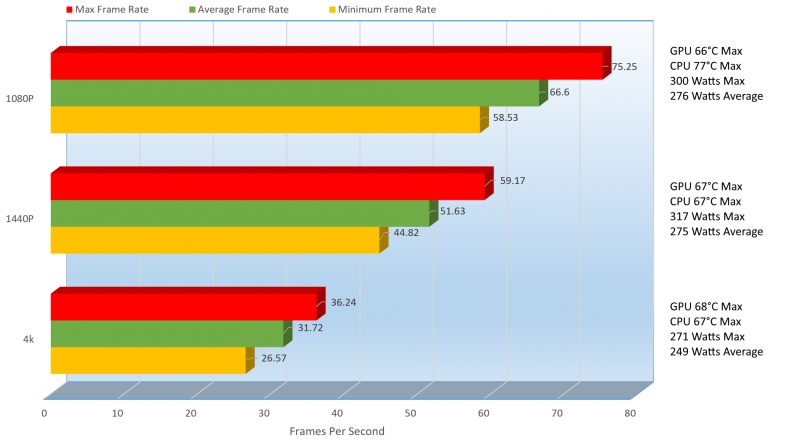 I tested at 1080P, 1440P and 4K UHD (3840 x 2160). This game surprised me a bit at how much it took. You can see at 4K, it was not playable at a chunky 45 frames per second average, consuming on average 261 Watts and heating up that CPU to 70°C. The GPU handled it a bit better heating up to 65°C, both temps are not high by any means but the GPU seems to be keeping cooler. At 1440P, the game is excellently playable at 86 frames per second, 91.1% better than at 4K and taking up on average 278Watts only 6.51% more, that’s a decent exchange. The CPU again maxed out at 70°C while the GPU dropped a degree at 64°C. At 1080P, you are free as a bird hitting frame rates on average at 117, 26% better then at 1440P and draining the power plant running on average 286Watts. The CPU stayed at a decent 70°C while the GPU regained that lost degree and went back up to 65°C. Beautiful graphics and the engine seems to be relatively well optimized. The 2070 and 9700K did pretty well on this game also, especially being that this is a newer game and all. 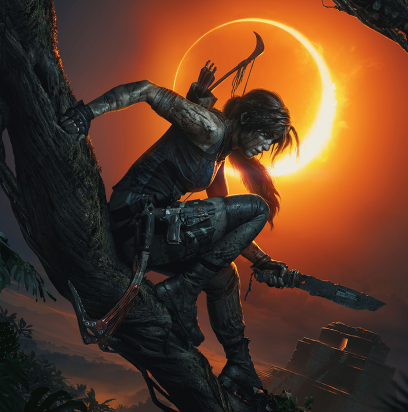 Let’s check out Shadows of the Tomb Raider. 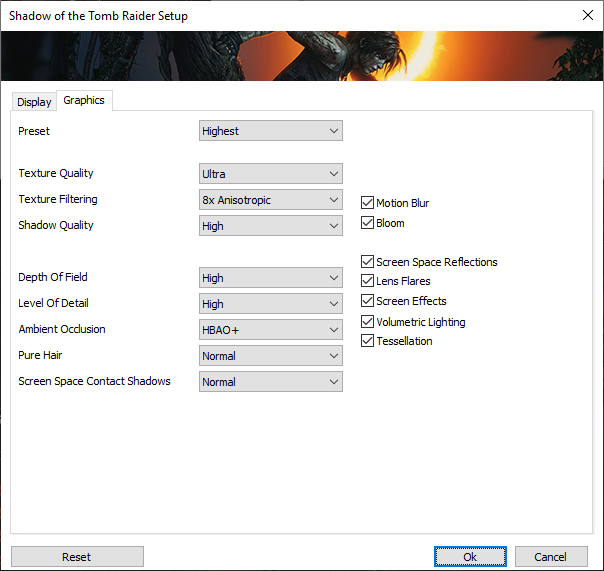 Here are the presets for Shadow of the Tomb Raider, I ran all tests at the Highest Quality settings changing only the resolutions. I tested at 1080P, 1440P and 4K UHD (3840 x 2160). 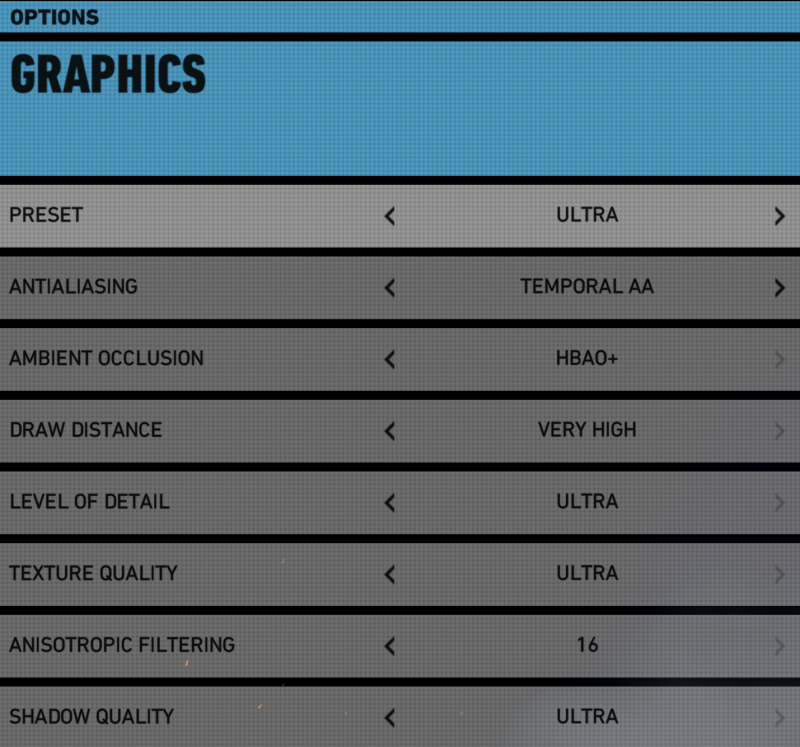 Even though some areas show Ultra, High and Normal, those as the preset implies are the highest settings available. Historically as I have tested before, Tomb Raider has not taxed the cards as much as this one has, you can see at 4K, we have a slide show at 30 frames per second on average. 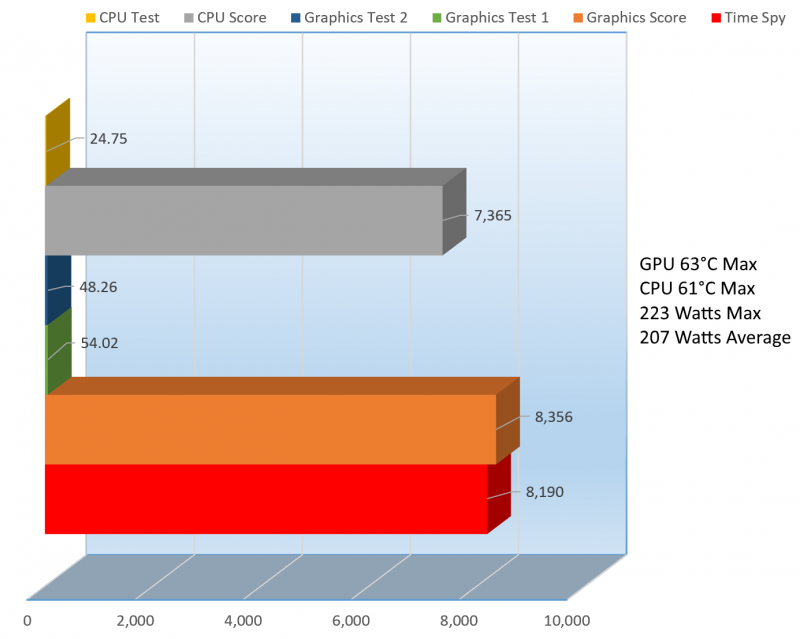 It is so bad, the average wattage was only 255 Watts and the CPU and GPU kicked their feet up on the table and heated up to 54°C and 62°C respectively, they just gave up the ghost. At 1440P, we were almost 100% playable at 54 frames per second, up 44.44% above 4K’s FPS and consuming 246 Watts on average. The CPU now woke up and heated up to 62°C, 14.81% higher than before and the GPU was 4.84% hotter at 65°C. 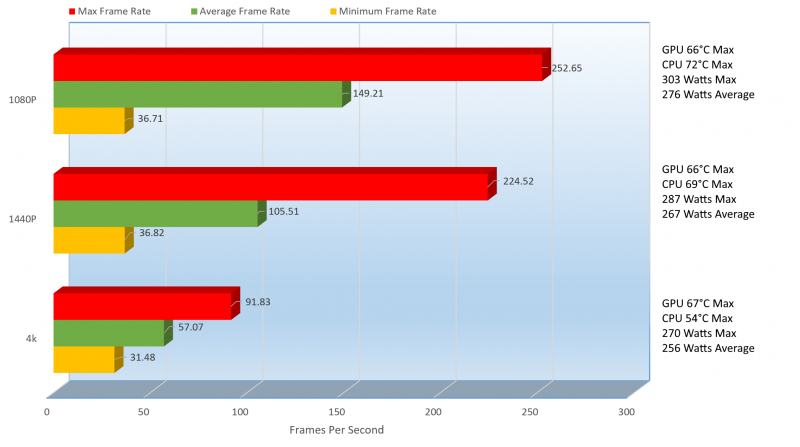 1080P is totally playable at 78 frames per second and consuming 2.5% less power on average than its 1440P sibling. While the power consumption was less, the CPU temperature increase a mere 4.84% to 65° and the GPU maxed it and the previous test at 65°C as well. Laura kicked up the notch here and put the system to the test, demanding more and the RDY VIBG202 buckled a bit but picked up the pace. 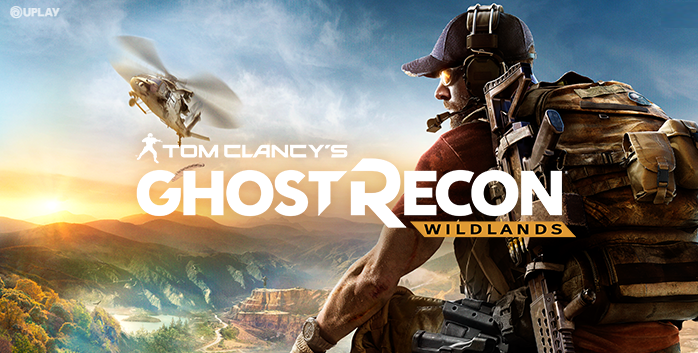 Next up, Tom Clancy’s Ghost Recon Wildlands. Here are the presets for Wildlands, I ran all tests at Ultra changing only the resolutions. I tested at 1080P, 1440P and 4K UHD (3840 x 2160). The Ultra preset killed it on this game, at 4K, totally unplayable at 31.72 frames per second and consuming on average 249 Watts. The CPU was a toasty 67°C and the GPU 68°C. At 1440P, we saw a resurrection of sorts having the frames per second count improve 62.77% coming in a t 51.63, not 100% playable but very close to 60 fps. During this test, the average power consume was 275Watts and the CPU and GPU matched at 67°C, mirroring the previous results and 1° lower on the GPU this time around. At 1080P, the FPS count was 28.99% faster then at 1440P. this time achieve 66.6 frames per second. This time the average was only 1 watt higher than before coming in at 276Watts. With that lower resolution, the CPU kicks in more and heating itself up to a concerning 77°C, that’s 14.93% higher than before. The GPU on the other hand relaxed a bit only heat up to 66°C, 1° less than on previous tests. I like to run these all at their highest settings so that you know what to expect, a simple drop in preset will greatly improve playability on all games. For example, dropping Ultra to High or High to Medium and reduce many of those needless settings and greatly improve performance. My preferred resolution is 1440P, for even the highest end card, is the comfortable spot for gaming. 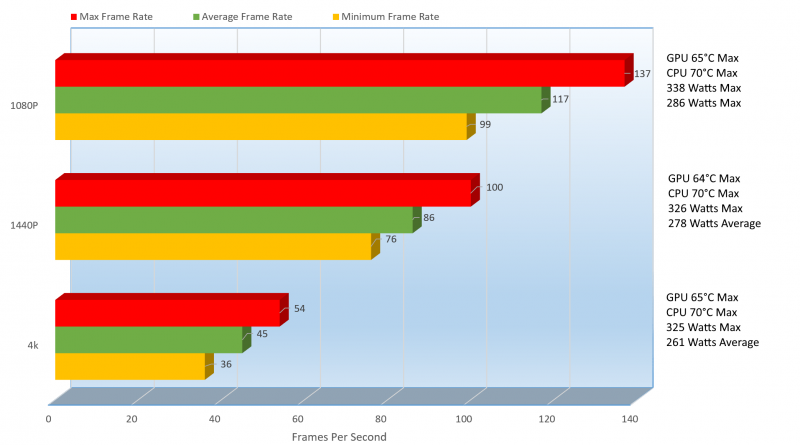 Mind you 4K is nice to, if anything just to say you can, but over 60 frames per second is the sweet spot. 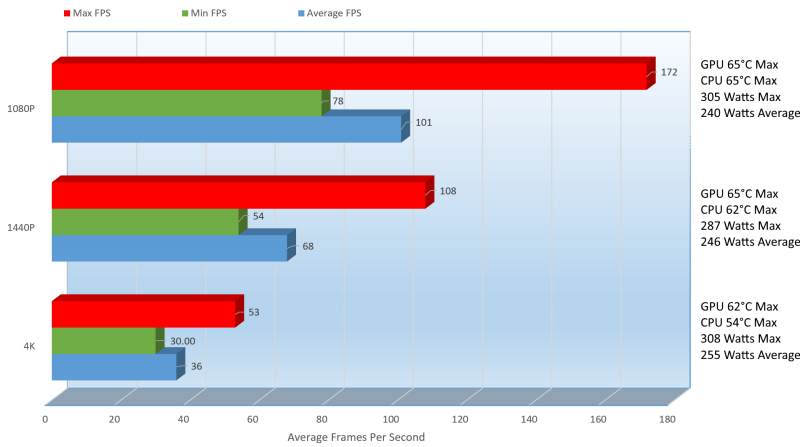 In the forums I frequent, a greater percent of the team runs their games at 1080P, but 1440P is my sweet spot. It seems to be the 2070’s sweet spot as well for half of the line up above a 1 setting change can change the performance for the other 2 games to achieve 60fps or above. 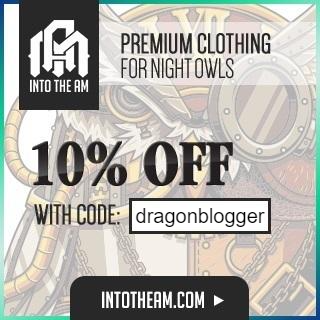 Now, not everyone reading this is a gamer and that’s OK, you might prefer some video encoding, writing, ripping some music or just browsing the web, so let’s check out some Drive benchmarks and afterwards some CPU Benchmarks.